The Tata Nexon subcompact SUV is a sub 4-metre offering which is the latest product to come out of the Tata Motors stable. With a new stylish body and a new design approach for the interior combined with new petrol and diesel engines and even a new 6-speed gearbox, the Nexon promises to be a hot selling SUV! Read on to know more! Striking! Especially in these bright shades or red or blue – that is the first thing that comes to mind when you first set your eyes on the new Nexon. There are still hints (strong and subtle) of Tata Motors design language that carries over from other cars like the Tiago and the Bolt. The headlights for example still swoop in a very distinctively Tata way and they come with LED daytime running lights and projectors. The grille, painted in gloss black, harks back to the likes of the Safari Storme with its bold and in-your-face design. Thankfully, Tata has done the smart thing and not given the Nexon a lot of that tacky chrome apart from a slim accent piece underneath the grille. Instead, what you do get, especially on the XZ+ variant, are satin while plastic inserts that are tactfully placed around the car. The side profile is what will really set the Nexon apart – in an almost signature way. The satin white inserts continue to form a very strong shoulder line and the roofline swoops down in almost a coupe SUV type of way! Tata has also uniquely given the roof a dark metallic grey colour option instead of just the standard black or white that other manufacturers have opted for. The wheel arches are typically muscular and the 16-inch wheels are finished in a diamond cut and black two tone design. The design of the wheels though could have certainly been nicer and more modern. Around the rear Nexon has a very distinct rake, which makes it appear to be taller than it is. The satin white styling continues around the back too with what Tata calls the X-factor design element. Just as with the front face, there is no ungainly chrome here either but instead a bold gloss black accent piece. The rear tail lamps are set high and get a distinct LED lighting pattern for the parking lights but the brake lights, indicators and reverse light still uses traditional bulbs. The rear bumper has a very cool 3D pattern that replicates the front grille and in general, has a great sense of robustness to it. Move to the interior and the new look with the bold dashboard and the freestanding front screen is refreshing. The 6.5-inch screen itself is high definition and very crisp with a brand new user interface. The infotainment unit also gets android auto and apple car play, something that is expected of a car in this price range. You also get the brilliant 8 speakers Harman audio setup, which deserves a special mention. The dashboard itself is two-tone with a black upper half and beige lower half with a large central plastic slab in the middle. This slab is painted in an almost liquid metal shade that also carries on to the steering wheel and the door panels tying up the design well. The central console that surrounds the audio and the climate control knobs are all finished in gloss black. The instrument gauge is crisp and easy to read and so are the buttons. Ergonomically too, with the new central hand rest, the Nexon is a comfortable place to be in. You also get a lot of storage space in the central console, which has a retractable slide type cover for the storage space, but there are no cupholders! Shocking! There is however a small storage slot for wet umbrellas inside the door panels with a water channel to drain out any water that might seep into the doors. The door cards also have adequate storage for a large bottle of water. The glovebox is cooled and also gets a tray to store your iPad on. The tray is removable and can also double up as a small table to eat food on – but we wouldn’t recommend eating inside the car anyways. The Nexon comes with height adjustment for both the steering wheel and the driver’s seat and the front seats in general are really well bolstered too. Sadly though, there is no leather interior option, even on the top of the line variant. The rear bench seat is also slightly sculpted out and almost feels like two built in bucket seats. You get a pair of individually adjustable rear AC vents and a flip down central console too along with a get a high mounted 12-volt charging port to add to the convenience in the rear seat. Getting in and out of the rear though is slightly trickier because of the sloping roofline but surprisingly; there is still a considerable amount of headroom and legroom. There are areas where improvements can be made though. For example, the quality of some of the plastic trim like the rear cup holders or the dashboard panel around the screen still isn’t the best and the screen could have benefited greatly with a painted or chrome surround. The USB and AUX slots are awkardly inset behind the gear lever and if you need to change a cable that connects to your phone, it can get quite fiddly. The Nexon isn’t just a brand new body and a brand new interior. The equally big news are the brand new engines. So lets start with the popular diesel. The Tata Nexon diesel is a 1.5-litre 4-cylinder turbocharged unit that makes a respectable 108 bhp and an even more respectable 260 Nm of peak torque! And all the power on paper translates well to power on the tarmac. The engine pulls well in almost all gears and there is very minimal turbo lag. The 260 Nm of torque is very apparent and even in fourth gear at just 1500 rpm, you have enough poke to get moving rapidly. The diesel engine is also much more refined in terms of noise levels but there is that tad bit of vibration that does filter through, especially in full throttle conditions. But, overall, a big leap ahead in terms of refinement. Its not just the diesel engine that is new, but also the petrol. Essentially, the Nexon gets the same 3-cylinder 1.2-litre engine that you get in the Tigor and the Tiago but with an added turbocharger. Power is boosted from 84 to 108 bhp while torque is up from 114 to 170 Nm. And boy does it get a move on! Get it in the power range and let the turbo spool up and the Nexon rapidly gets to triple digit speeds (and higher) without breaking a sweat. That said, the turbo does get along its share of turbo lag and under 1500 rpm there is just no usable power which might be a bit of a problem while driving in an urban environment. The gearboxes for both cars are also brand new. 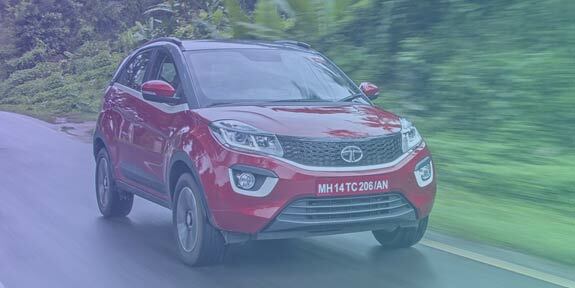 Tata has dropped the older 5-speeds and opted for a new 6-speed instead and it is considerably better than the older one. Shift action is crisp and the slight vagueness of the older gearboxes have almost vanished. The clutch is light too but what the Nexon really needs is an AMT or conventional automatic gearbox. Although not available immediately, we expect Tata to bring in an auto option maybe sometime next year. You also get three driving modes on the Nexon that can be changed using a rotary knob controller. One can choose between City, Eco and Sport – all of which drastically change throttle response. Although we personally prefer the Sport mode as it offers the full torque and power figure, we found city mode to be the most balanced overall with good smooth throttle response as well as slightly better fuel economy. The Nexon runs on 215 section tyres and 16-inch wheels, which gives the subcompact SUV a ground clearance figure of 209 mm – one of the best in class. The higher stance should ideally result in higher ground clearance, which in turn would cause chaos to the way the Nexon handles, but it doesn’t. In fact, high-speed stability is one of the best in class and so is the overall feedback from the suspension. Steering is slightly on the heavier side but that does make driving the Nexon a little more involving and a lot more confidence inspiring. And the good driving dynamics do not come at the behest of an abnormally stiff chassis setup that ruins ride comfort. In fact, the Nexon probably has one of the best ride qualities in its class both at higher and lower speeds. Body roll too is acceptable and the overall chassis balance of the Nexon is pretty admirable. On the safety front, the Tata Nexon gets two airbags and ABS as standard on all variants. . In fact, the ABS aided brakes are more than adequate on the nexon and the subcompact SUV comes to a halt under emergency or normal braking very quickly and without a fuss. 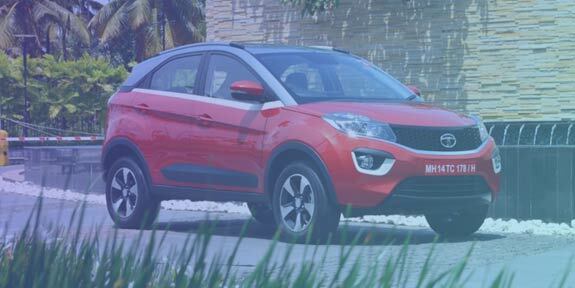 The Nexon subcompact SUV is a make it or break it product for Tata Motors. Going up against the likes of the Maruti Suzuki Vitara Brezza that sells well over 10,000 units a month and the Ford Ecosport, both blockbusters in their own right is not an easy task. That said, Tata Motors has certainly gone above and beyond to make sure it leaves an impression the first time you see it, the first time you get in it and the first time you drive it. Yes, there are still a few rough edges in terms of the quality on the interior trim, but overall, the Nexon might be the new gold standard for this extremely popular subcompact segment.